The perfect place to rest your morning coffee or enjoy a casual meal outdoors with someone special, our Berlin Gardens Poly Round Patio Bar Tables are the perfect addition to your outdoor furniture decor! Pair with our Poly Swivel Counter Stool or Bar Stool - depending on the size table you choose - to create a casual, sleek look that you can incorporate into any outdoor setting. The quality of construction and beauty of our Berlin Gardens Bistro Sets were enough to convince DutchCrafters owners Jim and Linse Miller to purchase and set for their patio. As you can see in the photos, their outdoor dining space makes for a beautiful place to entertain family, friends and even the occasional work related get-together. 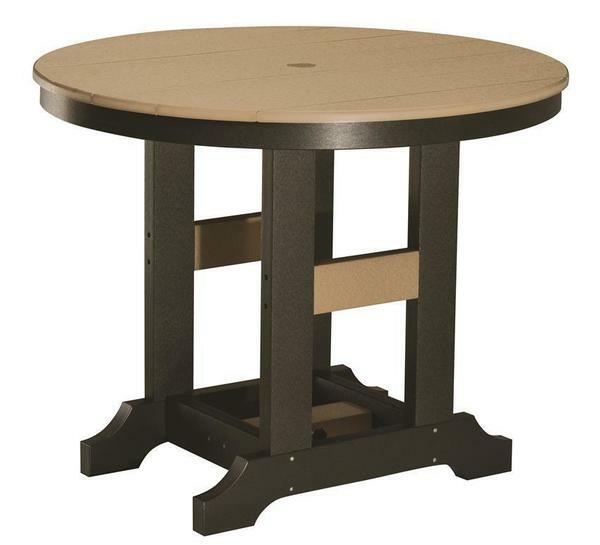 Our 38" Round Patio Table is handcrafted by skilled Amish woodworkers - from an eco-friendly material called poly lumber. Unlike traditional wood furniture, poly lumber will not require maintenance when left outdoors. Your table will not chip, crack, rot, or develop mold and is sure to give you decades of continued outdoor enjoyment!